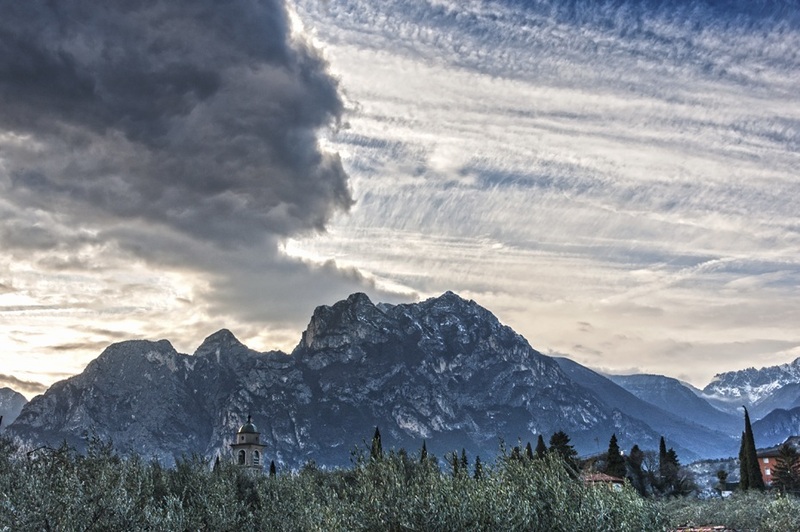 Do you remember our post on what to see and do around Lake Garda a few weeks ago? 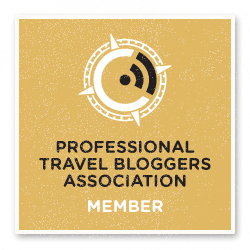 We announced our participation to the #MyAktivGarda blog tour, and what a trip it was! 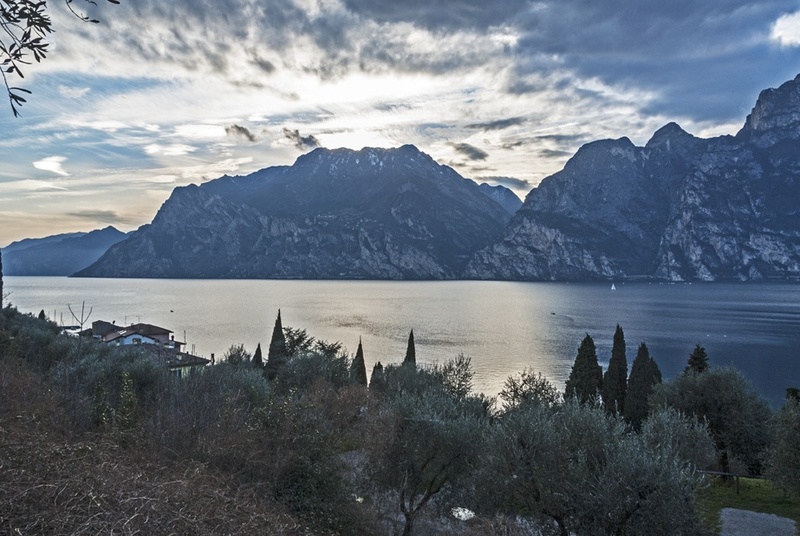 The northern shore of Lake Garda is one of Italy’s adventure hotspots. Do you want to know more? It’s #MondaysinMilan today. So, why are we writing about Lake Garda? Because nature and adventure are our passions, and we want to introduce you all to the best adventure hotspots around Milan. 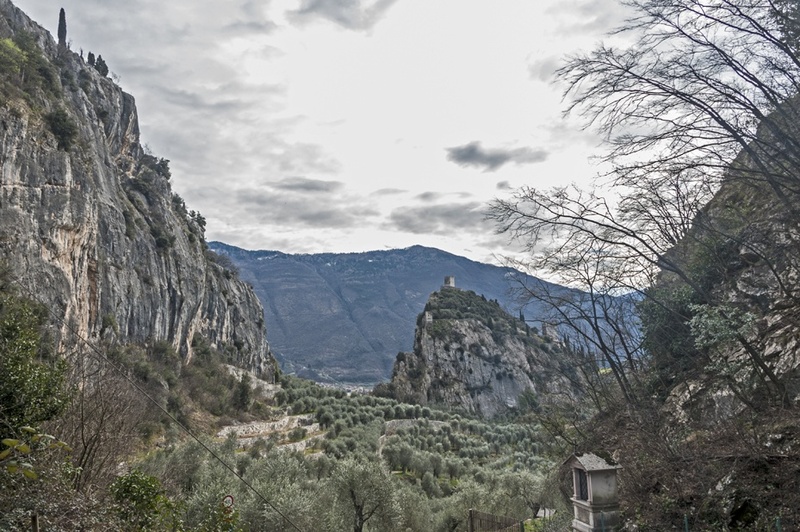 The northern shore of Lake Garda is our first one – bungee jumping will be next! The shape of Lake Garda, the largest of the Italian lakes, is reminiscent of a ladle, with a narrow ‘handle’ jutting northwards, to the Alps. The southern shore is warm and genteel, a land of palm trees and Mediterranean atmosphere, with palm trees and alfresco restaurants. Move north, and everything changes. Wind blows sharp, mountains border the lake on two sides. Nature is wild and untamed. Lakefront cities look less manicured than their southern cousins; souvenir shops are outnumbered by stores selling climbing and hiking equipment. Windsurfers zip across the lake, while paragliders whoosh down from the snowcapped peak of Monte Baldo. 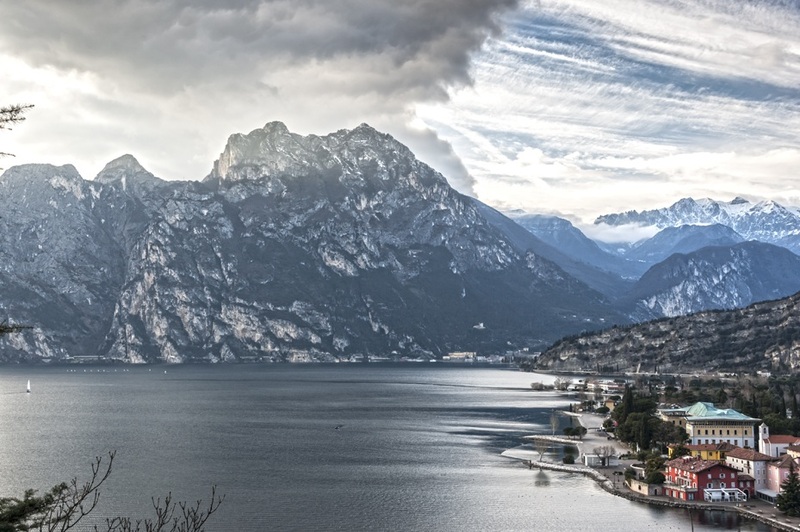 The northernmost reaches of the lake, near the town of Torbole and Riva del Garda, are historical border lands. Here, mountain passes divided what was once the Austro-Hungarian Empire and the Kingdom of Italy, until the end of World War I.
Nowadays, the German-speaking influence is alive and kicking. 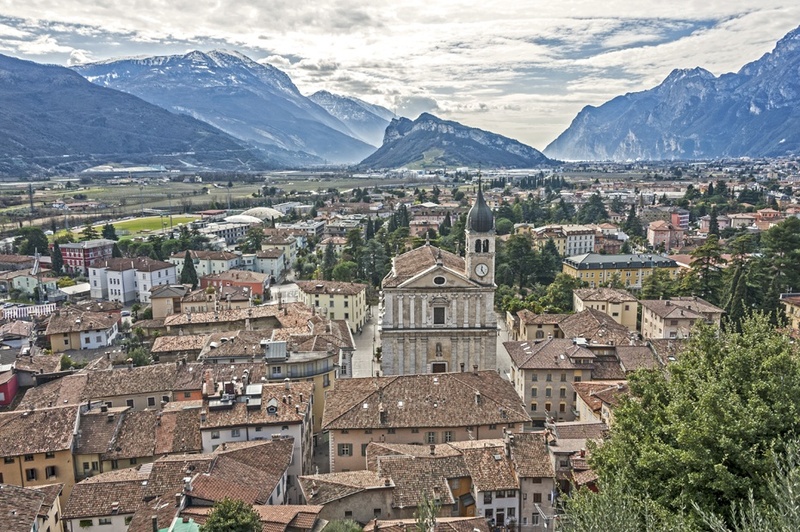 German rivals Italian as lingua franca of the region, tourist leaflets are bilingual and receptionists and restaurateurs are likely to be fluent in both languages, as well as English. 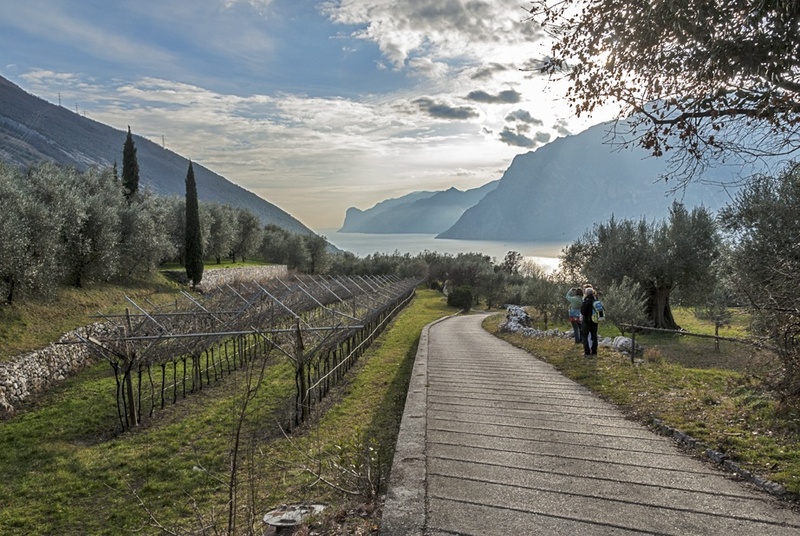 The Torbole area is an adventurer’s haven, with countless opportunities for adventure activities and outdoors exploration. Hiking, climbing and mountain biking hold the top 3 positions as most popular things to do in the area. Our hotel, the aptly-named Aktivhotel Santalucia, was the perfect base for an adventure holiday – created by outdoor-lovers, for outdoor-lovers. The clues were everywhere. There was a bike tool kit on the gate, bike storage inside, plenty of info on trails in the area, a protein-rich breakfast (a rarity in Italy!) and a wellness area to relax after a day out. 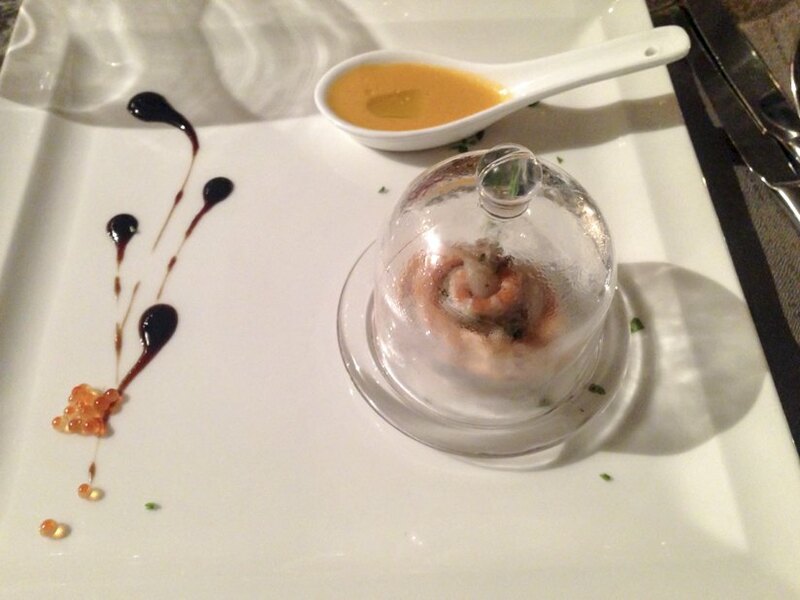 Not to mention, the area offers delicious food and a unique cuisine, with delicacies coming from small local producers. But more on that later. Get your adventure hat on, and see what the area has to offer! There are loads of trails to choose from in this area, including GardaTrek, three multi-day loop trails between lake and mountains. 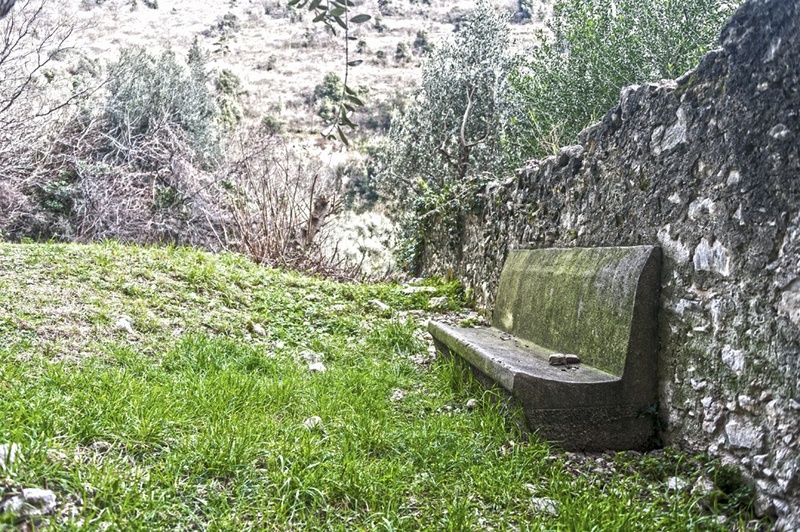 We opted for the easy but scenic hike up Valletta di Santa Lucia, just behind the Aktivhotel. 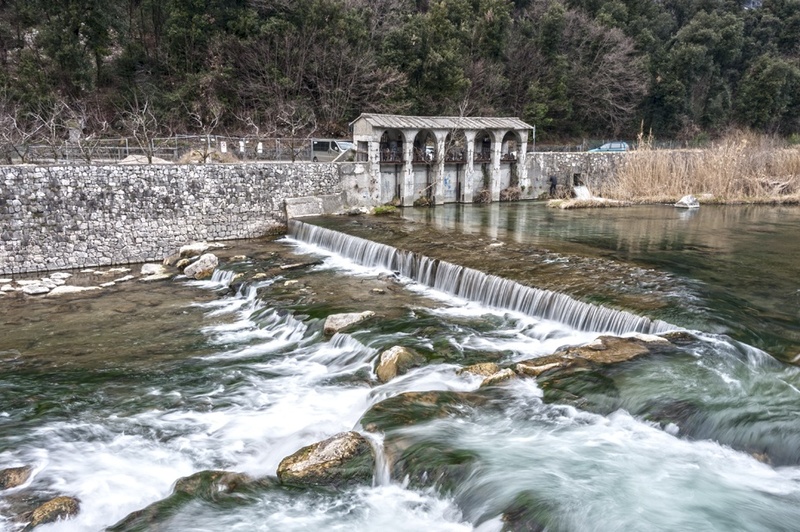 The trail climbed gradually, following an ancient Roman road, once the only connection between the lake and Monte Baldo. 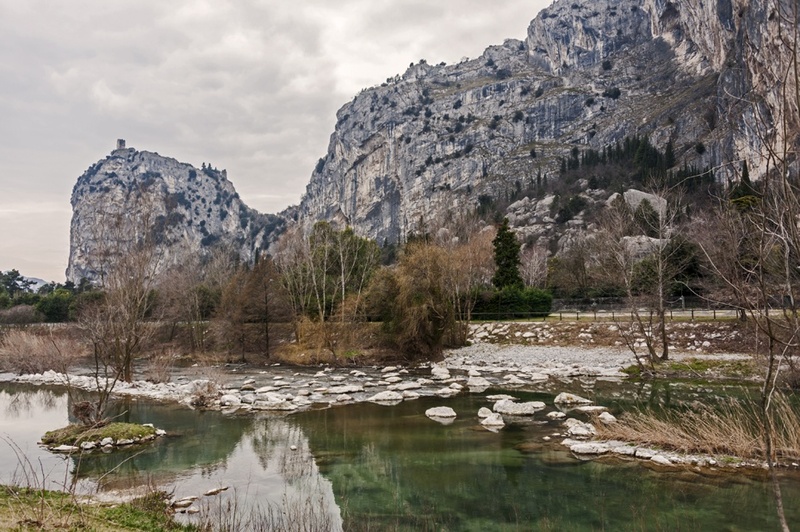 This valley’s history hid an extraordinary secret. In 1439, a Venetian fleet was brought down the valley to sail across Lake Garda, to fight the troops of the Duchy of Milan. When Christine our guide told us, I couldn’t believe that she said. Ships? Full blown warships, being brought over a mountain pass, over five hundred years ago? 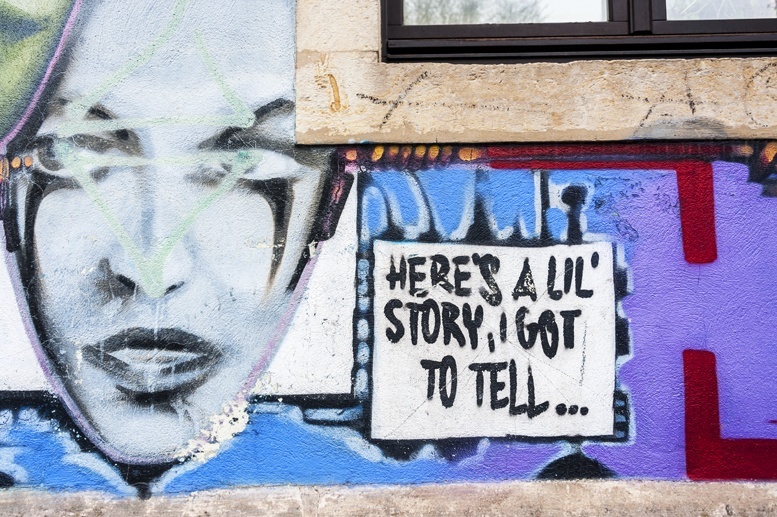 Sounded like something out of a fairytale – but it’s history, yet another testament of how unique this area is. The valley was peaceful and incredibly picturesque. We saw the lake from above, painted gold by the setting sun, and surrounded by the snowy peaks of the Alps – Monte Baldo towering over them all. 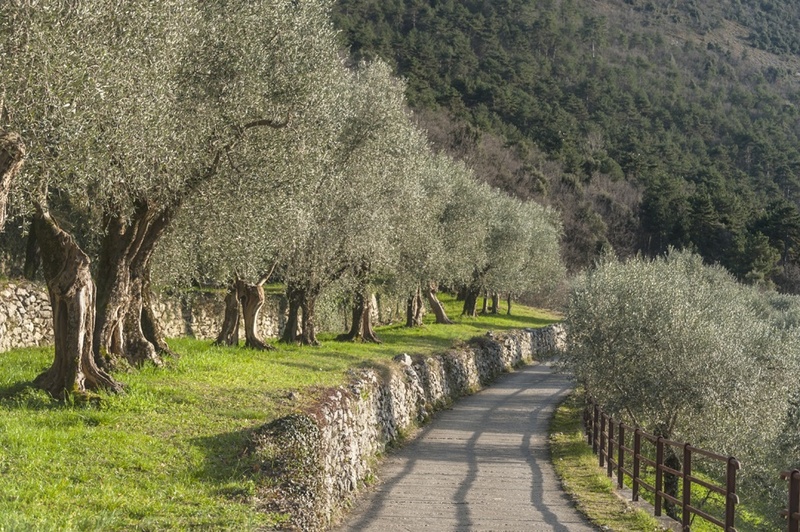 We walked across olive groves, the northernmost in the world, planted on terraces cut from the mountainside, and along century-old stone walls. We crossed sleepy villages with a stunning view over the mountain and lake, and few other hikers were out. 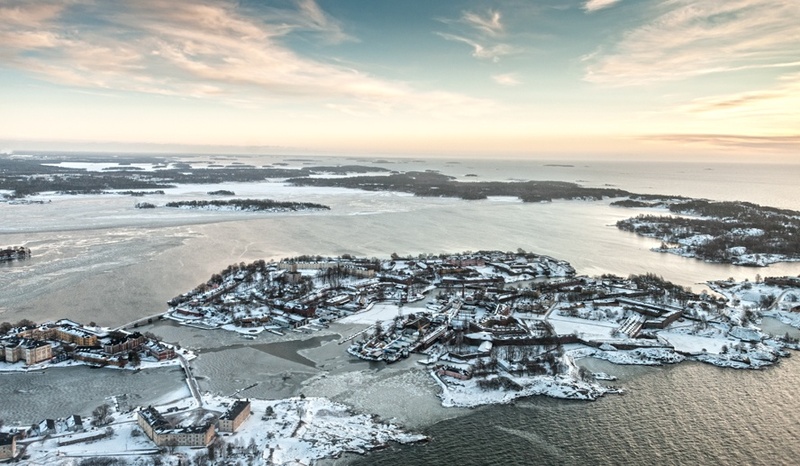 One of the perks of visiting off-season – in summer, the area is very busy. It was the perfect introduction to the area, its history and characteristics – the perfect way to begin our weekend in the area. 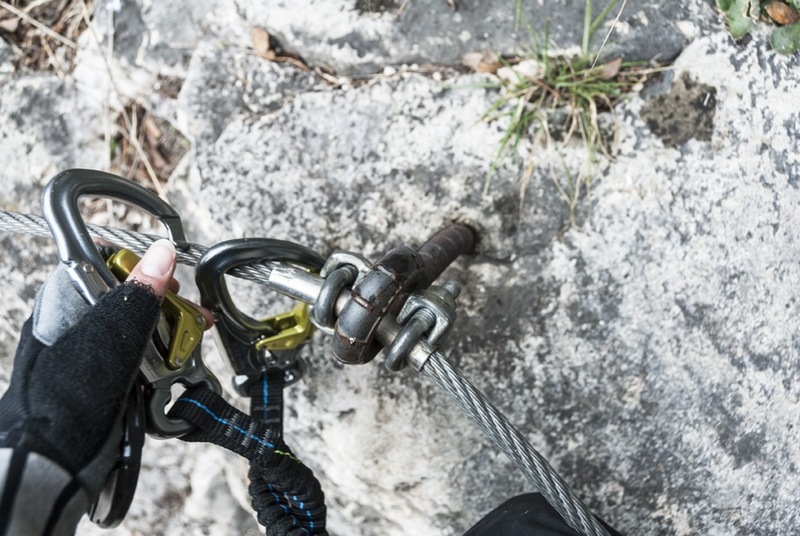 Do you know what a via ferrata (ferrata for short) is? 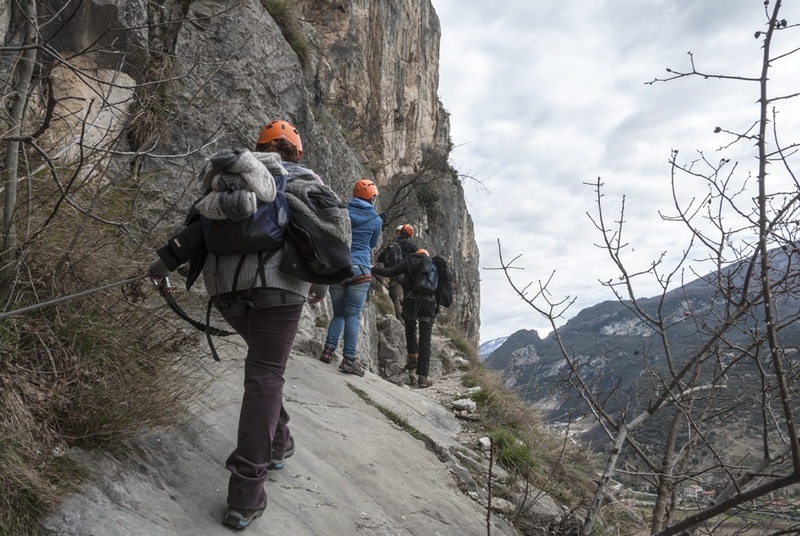 Born around the corner in the Dolomites during WW1, vie ferrate are a system of cables, ladders, steps and handles stuck to the mountainside, to get where mountain paths can’t reach without knowing how to rock climb. Vie ferrate were invented by Italian soldiers, to carry weapons and supplies across the lines without being exposed on mountain paths. One hundred years later, vie ferrate are used by hikers as a hair-rising alternative to usual trails. 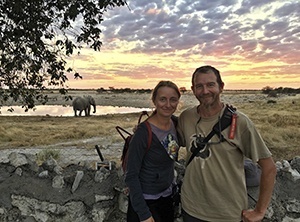 Hikers are equipped with a harness and clips that they use to secure themselves on a steel cable running parallel to the ‘path’ they need to follow. There are vie ferrate of various difficulty levels – from easy ones like Ferrata del Monte Colodri, the one we did, where you walk most of the time, and only occasionally climb upwards using steps or ladders, to scary affairs where you end up hanging over hundreds of meters of void. 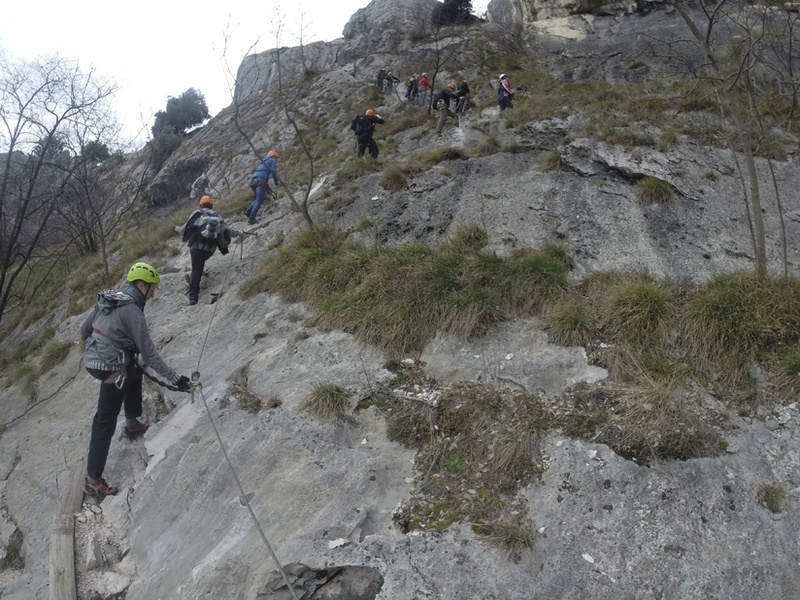 Ferrata del Monte Colodri is a great introduction to the world of vie ferrate. If it’s your first time trying the experience, it’s highly recommended to go with a guide. 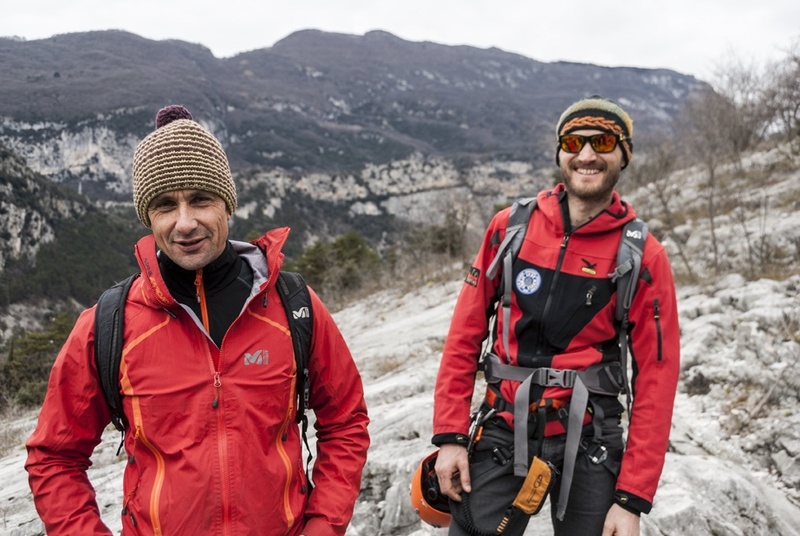 We were guided by Jiri and Simone from Mountime in Arco, a climbers mecca just a few kilometers from the lake. On a ferrata, you get to know the rock. You learn to trust your steps, your boots and your equipment – essential skills if you’re interested in getting into rock climbing. It’s a more ‘active’ feeling than simply walking along a mountain path. You need to push yourself upwards, use your legs and feet to feel the rocks and the terrain, your arms and hands to grip rock, ladders and handles. 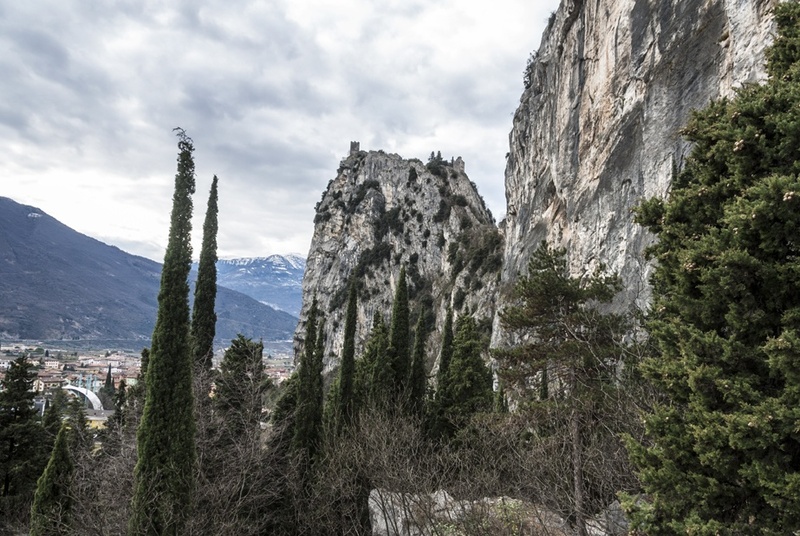 You start the ferrata a few minutes from Mountime, and return to Arco from the top via an easy mountain path with stunning views of Arco from above. The view of the lake from the top of Monte Colodri more than makes up for the effort – and the sense of achievement of having made it is the sweetest of them all. If you don’t like the void, you’d better not opt for a via ferrata. Undoubtedly, there are times where you’ll feel ‘exposed’, and if you’re not comfortable with that, just go for a hike. 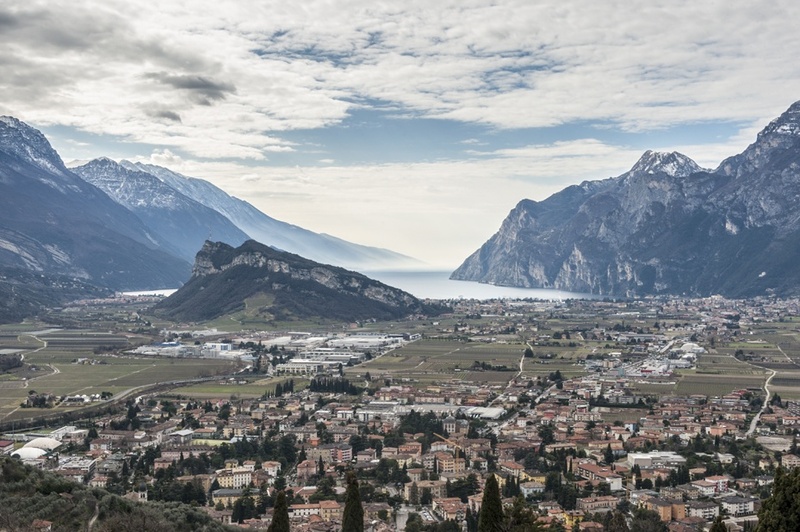 Mountain bikers will be spoilt for choice in the northern Lake Garda area. Hair-rising downhill trails? Check. Easier rides for the whole family? Check. Panoramic trails through woods, with stunning views over the lake? Check. And on top of that, if you’re feeling lazy, you can rely on the services of Luca from Bike Shuttle, who will pick you and your bike up from the end of your ride or take you to the top of that crazy downhill trail. Not being amazing mountain bikers, we opted for an easier ride, the beautiful bike path from Torbole to Dro, about 15 km away, running along the Sarca River. We rented our bikes from Carpentari Bike Shop in Torbole, and we were really pleasantly surprised by the quality of the bikes on offer. None of those flimsy bikes with unreliable brakes you often get from bike rental shops. These were top-notch bikes, with disk brakes and some even with carbon-fiber frame. We cycled towards the mountains, following the rushing mountain river, with its clear waters streaming through the rocks. The trail cut through the village of Arco, where we had to negotiate the streets with pedestrians and cars. But soon we were off again, across Arco’s pretty bridge, to what was perhaps the most scenic section of the trail. On our left, there were Arco’s famous climbing crags, with rock-climbers challenging gravity trying to make that 7B. We passed a ruined power station, stone houses and pretty green meadows, all with the stunning backdrop of the setting sun. We ended our ride with wine-tasting at Cantina Pisoni, producer of mountain wines produced following biodynamic farming principles. We visited his cellars dating back to the times when this region was still Austria, with the double-headed Habsburg eagle engraved on his oldest barrels. The wine was delicious, but the setting even more so, with the mountains all around and ponies wandering among the vines. There’s no better way to discover the lake than from the water. A sailing adventure on Lake Garda allows you to see the lake from a different perspective rather than just hiking/biking around it – the world around you looks more peaceful, the nature is less wild and people on shore move slower, as if you were travelling across a painting. We sailed for about two hours, in front of the village of Malcesine on the north-eastern shore of Lake Garda. The day was far from being ideal for sailing. Clouds were stacked all through the sky, and there was no wind. Just the previous day, the sky was clear and a steady breeze blew, and windsurfers flew across the lake at lightening speed. Nevertheless, sailing across Lake Garda was a peaceful, meditative affair. 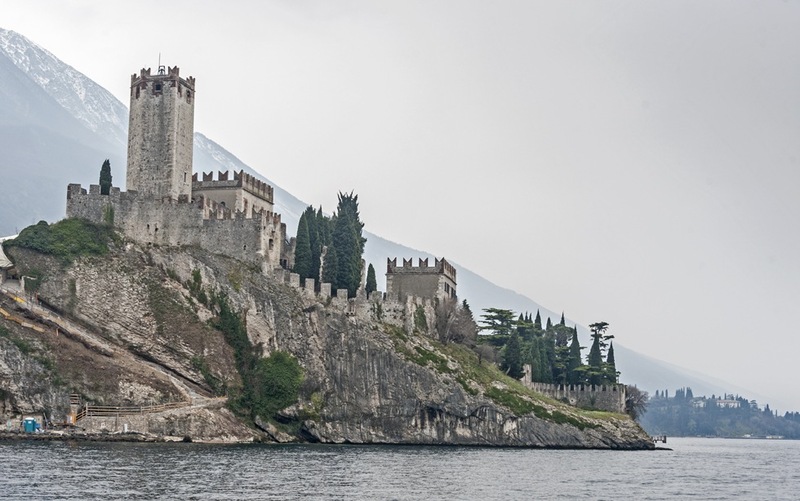 We travelled past pretty Malcesine castle, up to two tiny isles just across the water from Malcesine, and then back. Meanwhile, we were entertained by Mauro Testa, sailor extraordinaire and Olympian sailor in the Seventies. He knew the area like no one else, and we had fun listening to his sailing adventures and stories on how the area changed in the last 30 years. 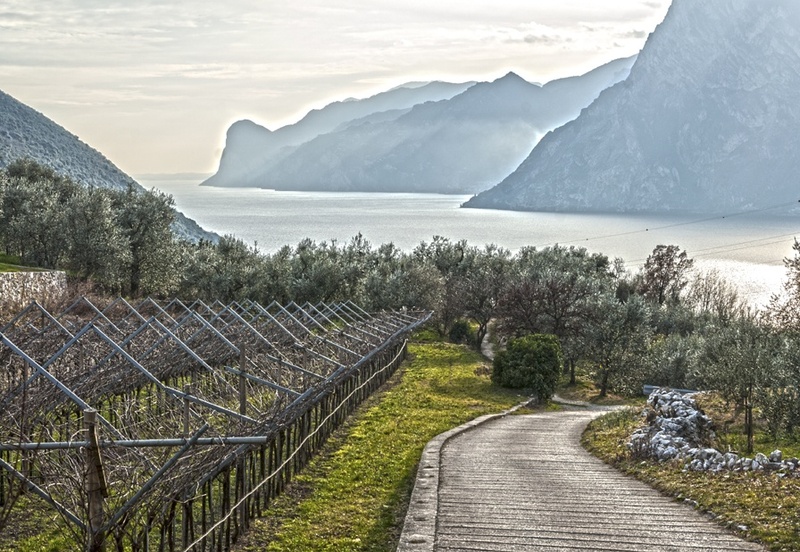 If you’re up to a longer, in-depth exploration of Lake Garda, stay tuned and watch this space. 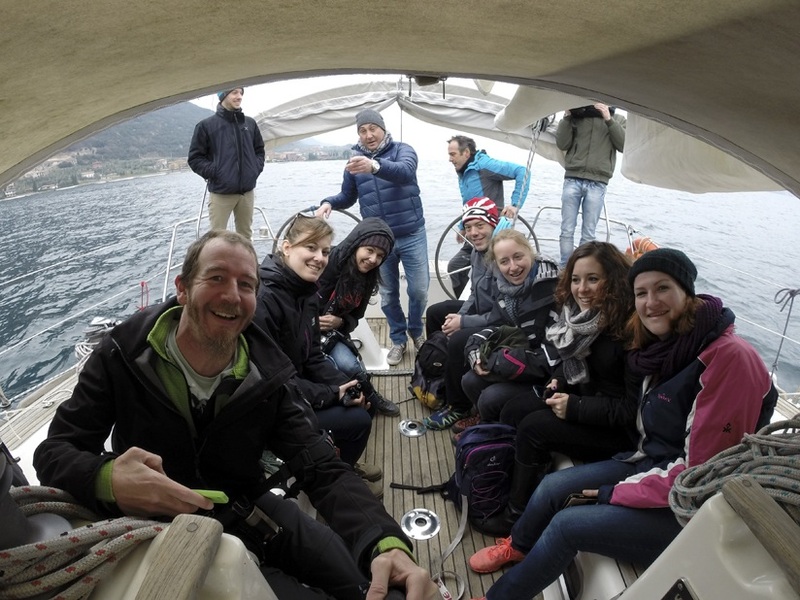 During our time on the lake, we met Leonardo, owner of sailing start-up Svelando. He’s currently preparing his fleet to start offering multi-day cruises on Lake Garda, including adventure activities, and meals at family-run restaurants or prepared on the boat with local produce. I can’t think of a better way to enjoy this lake. Can you? Adventurers will know there’s no better way to end an adrenaline-filled day than a delicious meal. I must say, we were definitely spoilt on Lake Garda when it came to food. Our first dinner was at stunning restaurant Al Forte Alto, housed in a former Austrian fort and run by friendly and charismatic chef Marcello Franceschi. We had a top dinner including local delicacies like carne salada (salted, cured beef, reminiscent of carpaccio) and homemade spaghetti with fish. Fish? I hear you say. Fish in the Alps? Yes, indeed. We also had the chance to meet Francesco Armanini, owner of Troticoltura Armanini, a fish farm breeding trout and Arctic Char in the crystal-clear water of the Alps. 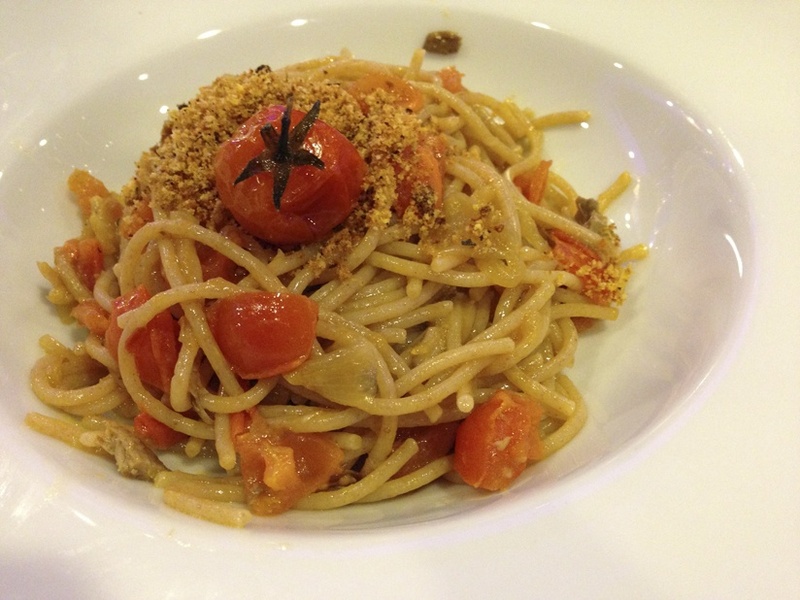 On our second day, we had dinner with Armanini products, and what a dinner it was! From mixed starters (including trout caviar) to pan-fried, sesame-crusted char, it was incredible. If you fancy buying some local produce to take home, your best bet is heading to Agririva, a local cooperative selling all kinds of food from local producers. You’ll find Armanini’s smoked trout, speck and other kinds of cured meat, as well as wild asparagus pate, wines and sweets. For us, the biggest food-related surprise in the area was Omkafe, a coffee-roastery and store dedicated to the joy of good coffee. We had a guided tour with the friendly owner, which included the tale of a coffee bean from plant to cup, a visit to their roastery and a delicious cuppa to end the visit. Omkafe offers a free coffee to all visitors, so if you’re passing by Arco, be sure to stop! 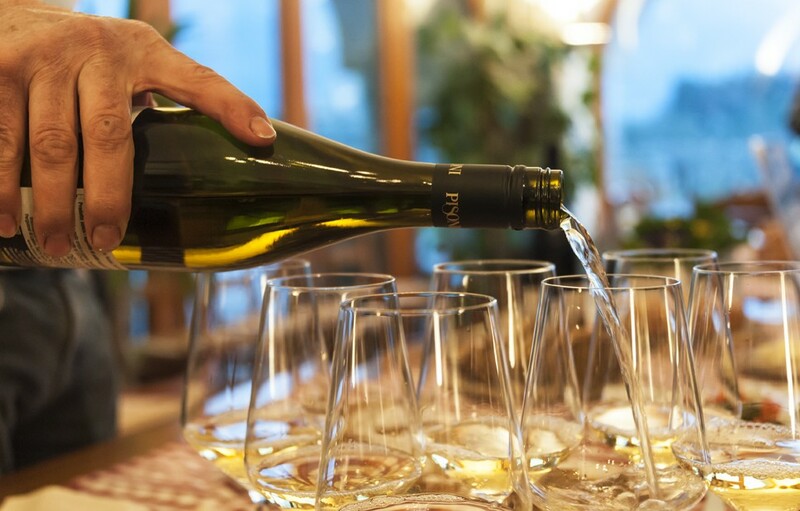 We were guests of the Aktivhotel Santalucia and other operators mentioned in this post during the #MyAktivGarda blog trip, organized by wonderful Ilenia Morandi of Gardamio, a destination blog on Lake Garda and the surrounding areas. As always, all opinions are our own. Beautiful photos as always! Sailing on the lake looks incredible. That looks like the perfect place for me. I love adventure and hiking and the views. It looks like a spectacular trip, although I have to admit, some of those via ferrata photos, and more so your description of the void, freak me out a bit. My teen would love it, me I am a bit of a chicken about certain things, like voids. I totally see your point Rhonda. This via ferrata wasn’t scary, but others are! Hi Margherita, those photos are so inviting. I can see why Lake Garda is an adventure hotspot. Not only it is so picturesque but there’s so many fun things to do. I definitely want to make it there sometime and I’ll include hiking and sailing to my itinerary. And, of course, the great food triples the appeal! 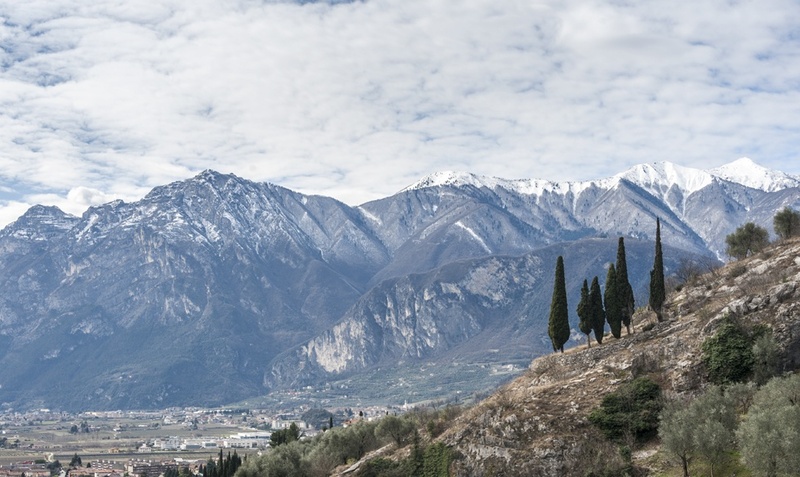 Thanks for the lovely post and the introduction to Lake Garda. Hey Monika! The hike was only about an hour or so, totally doable. The staff at Aktivhotel can help, even if you’re not staying I think. Thanks so much for your comment! I wish I did too Marj! Somebody else organized the trip… fortunately. Beautiful images and lovely post. Lake Garda is supposed to be a hotspot in Italy.